View all products in all categories - CLICK BELOW on a category. $18.00 - $28.00 High Quality affordable woven tapestries from Italy have an exquisite combination of colorful weave with gold and cloth thread. Various sizes available for framing,quilting, or made with a material frame and loop for ready to hang. 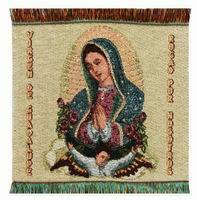 Ecumenicus can also personalize custom design and manufacture hanging tapestries to your needs and specifications. Beautiful wall hangings for your home! Our tapestries are woven and hand finished in Italy. They have an exquisite combination of colorful weave with gold and cloth threads and come with attachment ready to hang. Various sizes - average size 8" x 12". Small 9" x 9" collectable carpets with gold and cloth thread make a wonderful gift for someone special. Miniature size are Approx: 3.5" x 6.5" and can be used as a bookmarker or can be hung using the double sided magnet or tape. Can also be used in quilting. They come either in ENGLISH writing with "Peace to this House" or without writing unless specified.